Are your kids risking their spine health at school? Off to school! Feel the excitement of new clothes, new school supplies, and new friends. But before you let your kid run out the door to catch that bus, pay attention to that backpack they are wearing. Practically every kid is wearing a backpack these days but though commonly used, they are also commonly used improperly. 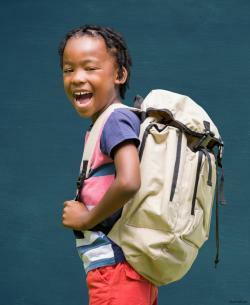 Improper use of a backpack can cause long lasting back and neck problems for your child. Backpacks causing a back and neck problem is kind of a no brainer, but still needs to be brought to parents’ attention so they can be consistent in correcting improper use. This will help save your child from having future spine problems and posture issues. Backpacks can frequently cause shoulder injuries also. Carrying a backpack improperly can cause uneven weight distribution but even if your child is wearing it properly there is still a max weight limit for each child. The backpack should only weight 12% of your child’s weight. This is a rough estimate but each parent should evaluate what the best weight would be. Your child should be able to wear the back pack without using any extra strain to counter the additional weight. Wearing the back pack on one shoulder or the other, places all the weight and pulls down on that one shoulder. The rest of the body over compensates to equal out the uneven weight placement causing the spine to curve and hips to protrude in the opposite direction. This causes that “bent sideways” look. Use both straps on the shoulder with the slack adjusted so that the straps are what takes the brunt of the weight. The bottom of the backpack should be near the curve of the lower back and NOT at the buttocks. As stated above, the backpack should not weight enough to increase efforts to maintain proper posture. If your child is bent forward or needs to use their hands on the straps to help with the load than that backpack needs to weigh less. Packing improper weight or failing to wear the backpack as directed in this article could cause long-term permanent damage to your spine leading to noticeable posture issues and potential chronic pain issues in their future. If you worry if your child is not using their backpack correctly and you live in the Norwood, Foxboro, or Framingham, MA area, feel free to contact us to have our physical therapists give your child a free back pack evaluation. Just call one of our offices and mention this article.